The Middlebury Institute Library is located in the center of campus, at 425 Van Buren Street in Monterey. The building was originally an Andrew Carnegie library, built in the Mission Revival style, for California’s first public library. Opening in 1911, it reflected Monterey’s Spanish and Mexican roots, and the city’s multi-cultural heritage. This is the landmark building with global and book images commemorated on the shield in the Institute’s logo. The Institute was founded in 1955 as the Monterey Institute of Foreign Studies. The school acquired its first building, the old public library, in 1961. In response to the steady growth of the Institute, that the building was expanded to house the Institute’s library with several major renovations including supports from the William Tell Coleman Foundation in San Francisco 1976 and the Fletcher Jones Foundation in Los Angeles 2003, to name a few. A noteworthy gift to the new library was from the family of General Joseph Stilwell: a collection of English and Chinese books. The core collection is comprised of more than 150 titles from the four-star Army General’s private library. They reflect his dedicated service and outstanding career in US-China relations during WW II, as well as his appreciation for Chinese culture and fluency in the Chinese language. This special collection is an example of the library’s rich resources for international education. 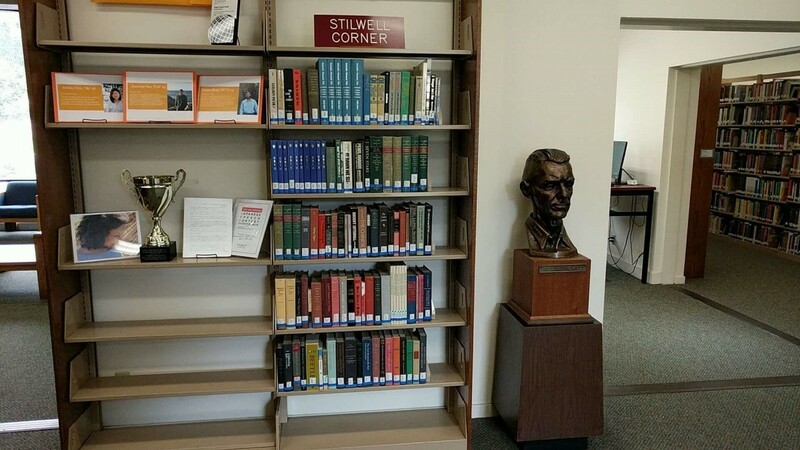 The Stilwell Family’s gift included a bronze bust of General Stilwell, and we will soon add a “Stilwell Plaque” in recognition of the generous major donors to our Stilwell Scholarships. In honor of General Stilwell’s legacy, the Institute currently offers three Stilwell scholarships to students from China. During the past three decades more than 40 Stilwell scholarships have been awarded to the Institute’s students. Today these graduates are making a huge difference in the world in general, and Sino-US relationships in particular. And the legacy continues to grow. This Spring we received a significant donation from a former Stilwell scholarship recipient who has successfully launched a venture capital enterprise in Beijing. It’s interesting to note that approximately 100 of the Institute’s 700 students are from China. They come for our renowned Chinese/English programs in Translation, Interpretation, and Translation Localization Management. The Institute’s library collections in these subject areas have been serving the Chinese language programs well and considered as the best in the field. As a service to our students, and scholars around the world, the Institute library’s online catalog can be searched in Chinese, Pinyin or English.